As 12,000 tired and slightly worse for wear delegates begin to recover from a busy 4 days at Conservative Party Conference, Number 10 will be breathing a quiet sigh of relief. With no gaffes, and few MPs causing trouble (Osborne, Gove et al stayed away), Theresa May sailed through her first party conference as leader with flying colours. More importantly though, we got our first real insight into what ‘Mayism’ might mean for the country. Overall, the delegates felt optimistic and united, with Theresa May and her new Ministers receiving a strong reception throughout. However, the mood was also serious – there was a sense that this Government would be a safe pair of hands, that all policy would be fully considered, and that there would be a lack of gimmicks. It was clear that many felt that Theresa May’s premiership (and the Labour Party’s collapse) was a great opportunity to reach out and expand beyond the Party’s traditional base. Perhaps this was most noticeable at the packed DUP’s reception, which had a lengthy queue and Conservative Party members greeted DUP MPs like old friends (although that may have been because of the free champagne on offer…). Unsurprisingly, Brexit dominated the entire four days. There were countless fringe events discussing everything from Britain’s role in the world, to what it means for the energy market, and how to ensure that young people aren’t left behind. However, there wasn’t the triumphant grandstanding that might have been expected – instead, the delegates seemed to understand that however they personally voted, it is now time to pull together and get on with the ob. The Prime Minister set the agenda by making her Brexit announcements at the start of the conference; giving party members something to rally around. For the first time, we learnt that Article 50 will be triggered by March next year and that the Queen’s Speech will contain the Great Repeal Act, which will adopt all current EU law into British law. Despite this, there was still a lack of detail besides and ‘Brexit means Brexit’ and how things are going to work practically. There was a palpable sense of confusion from businesses, and all were keen to engage and get their points across. Tellingly, it felt like most delegates were gearing themselves up for a ‘hard’ Brexit. The biggest change at this year’s conference was the Conservative Party’s lurch to the left, and an obvious U-turn on the austerity agenda. This was evident throughout the conference (e.g. Housing Minister Gavin Barwell proved his commitment to delivering 1 million new homes by 2020 by attending no fewer than 18 fringe events), however, it was Theresa May’s closing speech that really emphasised how her Government will differ from Cameron’s. Her speech proposed policies that included price controls, dropping the target for a surplus by 2020, taking action against house builders to increase the housing stock, and an even stronger stance on immigration than she had taken as Home Secretary. 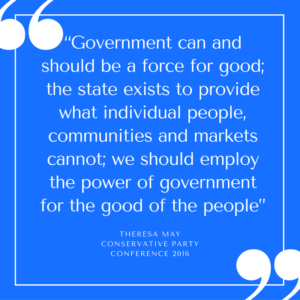 Perhaps the most controversial statement from May was that “Government can and should be a force for good; the state exists to provide what individual people, communities and markets cannot; we should employ the power of government for the good of the people”. Although likely to go down well with the public, it could also be the first sign of trouble ahead. These comments were widely criticised by business groups, including the CBI and IOD, and will put many pro-market Conservative MPs who are overtly pro-business in a difficult position. It is clear that businesses can expect a tougher ride under May than they are used to, and will have to fight hard to protect their interests. Overall the conference revealed that May and her team will be a safe pair of hands. She isn’t driven by ideology or cronyism – but a desire to help those who have fallen on hard times. She is also determined to deliver the Brexit that she thinks the country voted for (even if that means making compromises over issues such as passports, to ensure that we get full control of our immigration system). For the public, it is likely that she will offer a strong centre-ground alternative to Labour. However, it is unlikely that she will fulfil the hopes of many within the Tory membership of becoming a second Margaret Thatcher, and there will inevitably be trouble ahead.